Learn more about Katherine T Owen from a selection of interviews and presentations of her work. INTERVIEW. Click on the link below for a timeline of topics discussed in this interview. Or click on the video to watch it. Play the video or click below first to read more about the interview. In an interview about her book Be Loved, Beloved Katherine talked about how allowing God to love us is the best way to build our own self love and self worth. The interviewer was Mal Duane, author of the bestselling book, The Alpha Chick. The interview is no longer available, but click through on the link above for some quotes from the interview, and more about the book. Radio show with Jennifer Alhasa of Get Glowing. Read more about what the show included on the Spiritual Love Poems page. Follow the link to read what people said about the inspirational talk. Katherine ran The Hidden Paths Poetry Workshop in Swindon, Wiltshire, along with poet John Richardson and artist and musician Stevie Gilmore. This workshop and performance can be booked for other UK locations. Please click through and ask for more information if needed. 4.30 The healing journey doesn't always bring physical healing but always brings growth. 9.50 They tell you to rest, but living with severe illness and inadequate support is hard work…. When you feel sick you don't feel restful. 11.15 Having care. The experience of being reliant on caregivers. "I never knew who would walk through the door". 12.30 Samaya: " if I could have one book on a deserted island, it would be this one [Be Loved Beloved]." 12.40 There you are bed-ridden, how did the conversation with God start? 22.00 Samaya talks about how survival in itself can feel like an achievement. 25.30 Katherine and Samaya talk about the pressure we can feel for life to look perfect. 29.10 Katherine talks about how we can find it hard to love ourselves when ill. And how we can practise knowing that our loveability does not depend on what we do. We are love itself because we are part of God. 33.00 Samaya talks about her experience of receiving healing energy from the book Be Loved Beloved. 36.45 Samaya talks about how she understood Be Loved Beloved to be a conversation taking place with God, inviting us to hand over any current problem and ask God to address the obstacle. 38.41 A life of being ill can feel meaningless. This is one chapter of your life. Perhaps good will come from this. I am blessed and a blessing. 41.00 Samaya: Be Loved Beloved talks about the mystery of life and what it holds. It is a well of wisdom and healing and true grace. 42.45 Katherine T Owen reads the poem, Love Progressing. The poem speaks of the games we play to push love away. 50.30 Katherine talks about ‘simple’ as being a good thing. Samaya laughs at figs. Katherine talks about how the poems strip away the details of her life and leave something universal. Simplicity and depth combine. 56.00 You can find Katherine T Owen's books on www.lulu.com in paperback (Visit the shop and enter her name and the book title) and on kindle as an ebook. In the youtube clip above, Katherine T Owen is interviewed on Episode 6 of The Brewerton Fringe Show on Strawberry Green TV. In this 2.5 minute extract she talks about the value of positive self talk in a time of chronic illness. She speaks about how positive-thinking definitely does not mean always having a smile on one's face. The interview takes place at the Richard Jeffries museum - a local attraction in Katherine's home town of Swindon, Wiltshire, UK. The presenter is Andrew Brewerton. 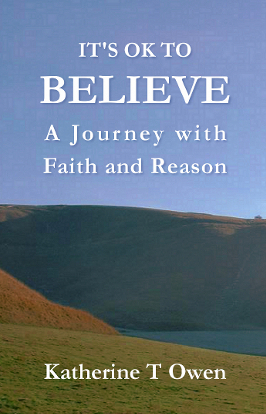 Click here to view or buy Katherine T Owen's book of spiritual poems: It's OK to Believe.